The chimney on this old house was in need of repairs when we bought it. 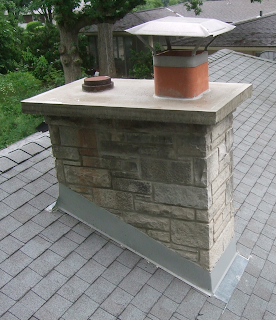 Obviously neglected by previous owners, the chimney had no overhanging cap, so water ran off the top and directly down the sides. It cracked and wore the mortar between the bricks, and flowed easily past the long-since-useless flashing. Encountering no resistance, the water dripped down inside the roof, causing a medium amount of damage to the surrounding roof wood. I hired a pair of contractors to fix the chimney: one to do the flashing around the bottom; the other to repair the tuckpointing (mortar) and to pour a cap. Luckily, the surrounding roof wood and shingles didn't need to be replaced, so I could simply fix the damaged mortar, replace the ineffective flashing, and then install a new cap to prevent new damage. The idea with the overhanging cap is that water flows off the top of it, down the sides of it, and then drips off of the sides, down onto the shingles below. The water does not flow on the underside of the cap over to the bricks, because there is a slight shape which prevents it. 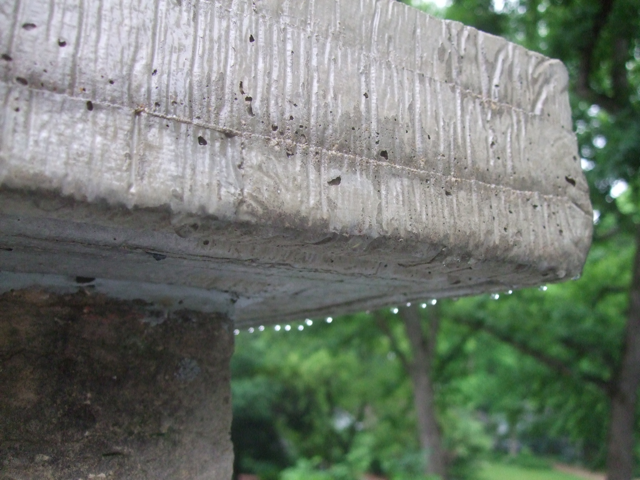 After a rain, I went up on my roof and took this picture showing the drops of water falling off the sides of the cap. The new cap also came with a new cover over my fireplace flue.